"Sparkling" " Immaculate" and with "Dazzling Ability" were words used recently by the national Press to describe the music of Gerry O'Connor, one of Ireland's most outstanding fiddle players. His family has played fiddle for at least four generations and Gerry is able to draw on this wealth of music learned from his mother Rose O'Connor and also from hand-written manuscripts passed down through the family. Later he came under the influence of Joe Gardiner the great Sligo fiddle player, who lived in Dundalk for many years. Gerry breathes new life and intensity into many long forgotten tunes from his home area in the North East of Ireland. His unique personal style and splendidly fluid bow-hand combined with technical virtuosity have brought him to concert stages throughout the world and have earned him international renown. He is a founding member of the band Skylark and recorded four albums with this highly respected band that had toured Europe for 10 years. The Brighid's Kiss album of his own band La Lúgh was voted album of the year 1996. 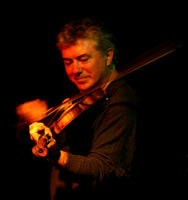 October 2004 saw the release of his album entitled 'Journeyman' which traces Gerry's musical development and experiences as a skilled performer in the traditional art of fiddle playing. Each of the twelve carefully crafted tracks celebrate the rich musical heritage of the great master musicians of the last century.